Kinney at the 2014 San Diego Comic Con International. Emily Rebecca Kinney (born August 15, 1985) is an American actress and recording artist. She is best known for her role as Beth Greene in the AMC television series The Walking Dead. Emily Rebecca Kinney was born in Wayne, Nebraska on August 15, 1985. In 2006, she studied and graduated from Nebraska Wesleyan University. She then moved to New York City, where she pursued a Broadway and acting career. Kinney performing at Rockwood Music Hall in NYC on 13 February 2014. Kinney started her career at the age of 23, when she participated in the play Spring Awakening, in which she played the role of Anna, a smart and carefree resident in a strict city. The following year, she participated in August: Osage County, where she played the role of Jean Fordham. It was announced that Kinney was cast a role on Showtime's The Big C, playing the role of Emily. Later, Kinney appeared on NBC's Law & Order: Criminal Intent, where she played the guest role of Jeannie Richmonds. Kinney made her film debut with Aunt Tigress, where she played the role of Aunt Gina. Kinney continued her acting as a variety of recurring, guest and cameo roles on a majority of films and television shows. Kinney was cast as a recurring character on AMC's The Walking Dead, where she played Beth Greene, the 16-year-old sister of Maggie Greene in Season 2, being 25 years old at the time. After being on the show for two years, she received a promotion to series regular, along with Chad Coleman and Sonequa Martin-Green. She then released her first extended play The Blue Toothbrush. Kinney participated in The Walking Dead: AMC Original Soundtrack, Vol. 1, in which she collaborated with Lauren Cohan on the single, "The Parting Glass". Kinney returned to the Law & Order franchise in Law & Order: Special Victims Unit, in the role of Haley Cole. She released her second extended play recording, Expired Love. In an interview with AMC, Kinney talks about the story of the album: "'Expired Love' is about my story. But I do think that with my acting career, my style seeps into my career a lot. My songs are similar to Tom Waits' in that they’re little stories. Sometimes I write songs based on one word or feeling that keeps popping up for me. And I do feel like, because I’ve never played a character for so long, that it can’t help but seep its way into things. It’s like, maybe this is why a particular idea keeps coming up for me, because this is something that we keep dealing with on the show!" Emily Kinney maintained a blog about her experiences in Hollywood, in which she stated that she is a vegetarian. She discontinued the blog in late 2012. ^ Jump up to: a b c d Korbelik, Jeff (8 February 2011). "NWU graduate enjoying TV, stage and music success". Lincoln Journal Star. Retrieved 13 February 2011. Jump up ^ "Laurence Lau and Emily Kinney". Playbill. Jump up ^ Slezak, Michael (3 April 2013). "The Walking Dead’s Season 4 Cast — Tyreese, Sasha, Beth Upgraded To Series Regulars". TVLine. Retrieved 21 February 2014. Jump up ^ Rosenberg, Eli (9 March 2013). "Q&A – Emily Kinney (Beth Greene)". AMC. Retrieved 9 March 2013. ^ Jump up to: a b Hansen, BreAna (9 February 2013). "An Interview with The Walking Dead’s Emily Kinney". The Daily Quirk. Retrieved 7 January 2014. Jump up ^ "Backstage Resources - Call Sheet Database for Agents, Casting Directors & More". Retrieved 13 October 2014. ^ Jump up to: a b "Emily Kinney Theatre Credits". Broadwayworld. Retrieved 2014-10-07. Jump up ^ ""Blue Toothbrush" by Emily Kinney: Project 30 in 30". Google. YouTube. November 13, 2010. Retrieved March 18, 2014. Jump up ^ "Emily Kinney – Expired Lover". Google. YouTube. Jump up ^ "Emily Kinney – Kids". Google. YouTube. November 25, 2013. Retrieved March 18, 2014. Jump up ^ "Emily Kinney – Be Good". Google. YouTube. 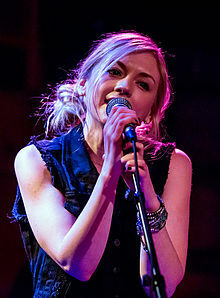 Wikimedia Commons has media related to Emily Kinney.